Heat oven to 350°F. Grease or spray four 8-inch round pans; place 8-inch round pieces of parchment paper in the bottom of each pan. Grease or spray parchment paper. In large bowl, beat all cake ingredients except food color on low speed 30 seconds, then on high speed about 2 minutes. Divide batter into 4 bowls and add different amounts of green food coloring to each. Bake cakes for 15-17 minutes. Remove from pans, peel off parchment paper and set on cooling rack. Cool completely. 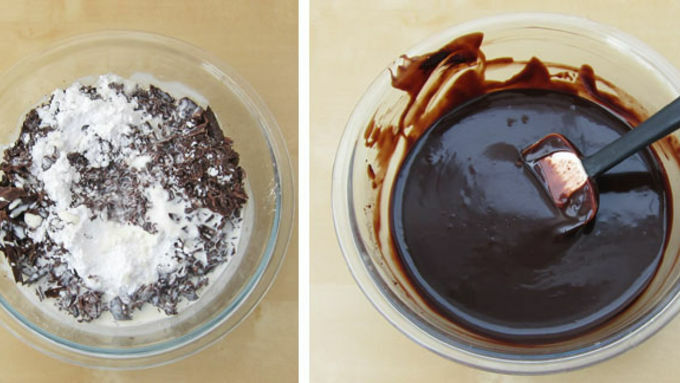 Combine chocolate, powdered sugar and heavy whipping cream in a microwave-safe bowl. Heat on high power for 30 seconds. Let bowl sit in microwave for 2-3 minutes. Then remove and stir. If not melted, heat for 10 second increments until melted and smooth. Allow to cool until thick enough to spread onto cakes. 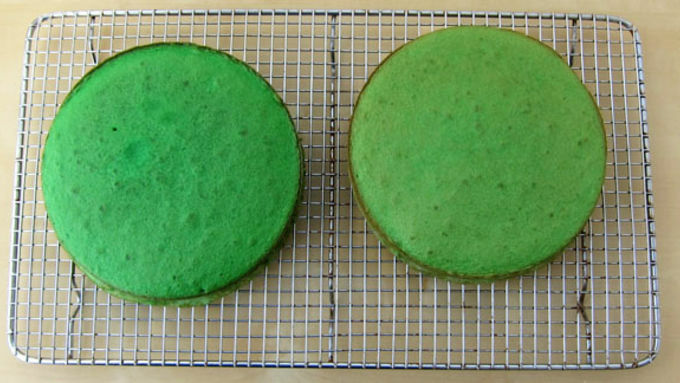 Set the darkest green cake on an 8-inch round cake board. Spread one third of the chocolate ganache over the cake. Stack layers from darkest to lightest, spreading ganache between layers. 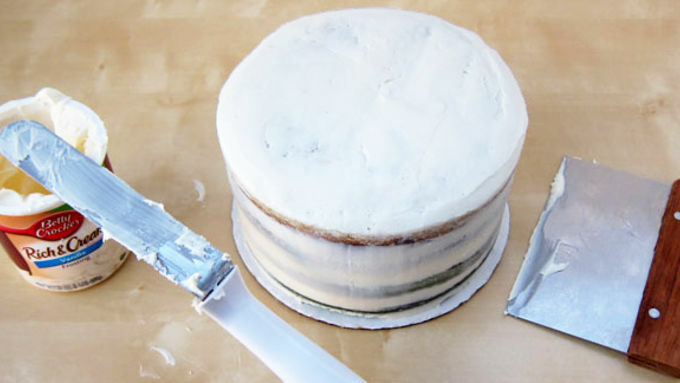 Spread a very thin crumb coat of frosting all around the entire cake. Divide the 2 tubs of frosting in 5 or 6 bowls. 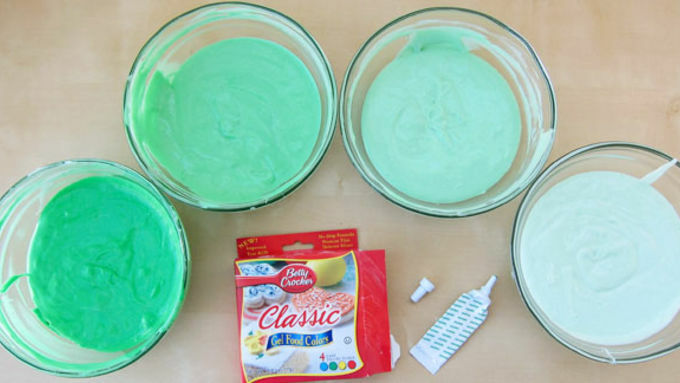 Add different amounts of food coloring to each to make various shades of green, leaving one bowl white, if desired. Fit pastry bags with star tips and fill with green frosting. 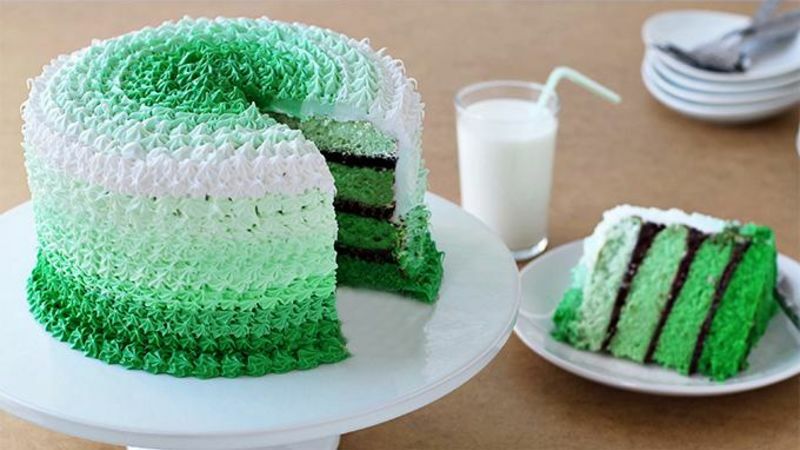 Pipe rows of stars, starting with the darkest shade of green at the bottom of the cake and going lighter as you move up the cake. 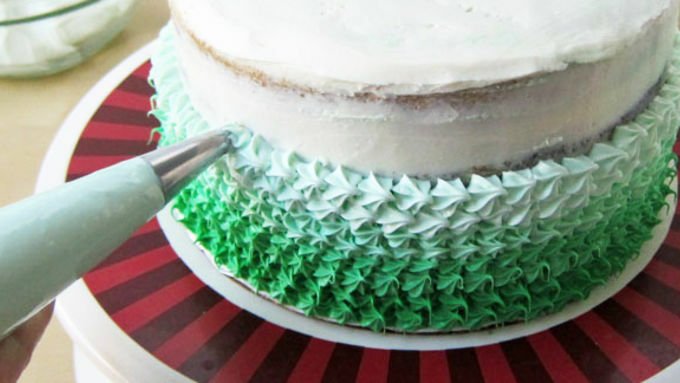 On the top of the cake, pipe stars in circles with the lightest shade of green on the outside and the darkest in the center. 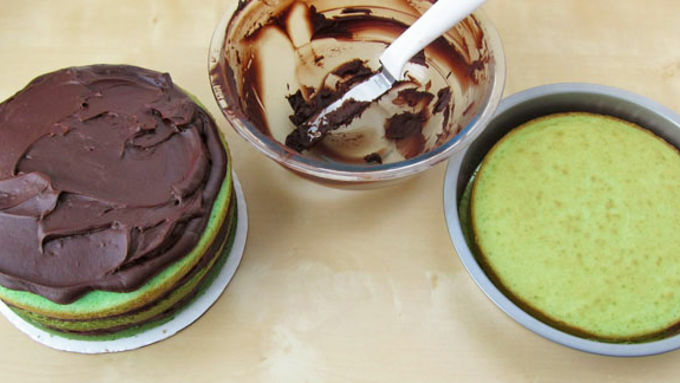 Place cake on a cake stand or plate and pipe a dark green border around the bottom edge. 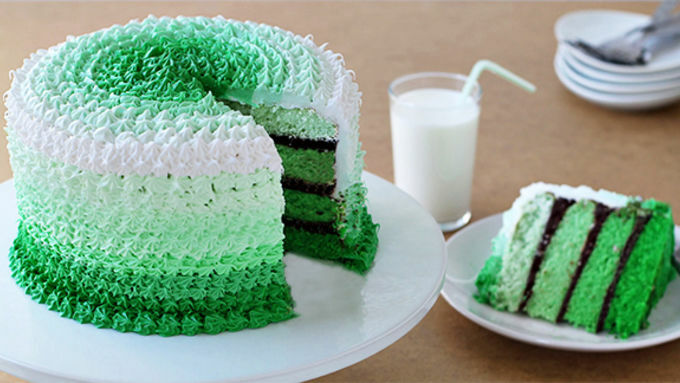 Celebrate St. Patrick's Day in style with this green Grasshopper Ombre Cake! This Grasshopper Ombre Cake is not only gorgeous shades of green, it has the delicious boozy boost of Crème de Menthe and creamy chocolate ganache. When I get together with my friends for a girl's night, I'm always asked to bring a dessert. A group is gathering this weekend so I've been busy in the kitchen baking up something fun for our party. With St. Patrick's Day right around the corner, I thought it would be fun to make a trendy dessert that was green; and to really make my friends happy – boozy. Ombre cakes are all the rage right now. To make this one boozy, I added a few splashes of Crème de Menthe to the cake batter. The liquor did double duty; it added a lovely mint flavor and a nice green color to my cake. I love mint with chocolate, so I filled my cake layers with a rich and creamy chocolate ganache. When frosting the outside of my cake I chose to pipe on little stars using a pastry tip. 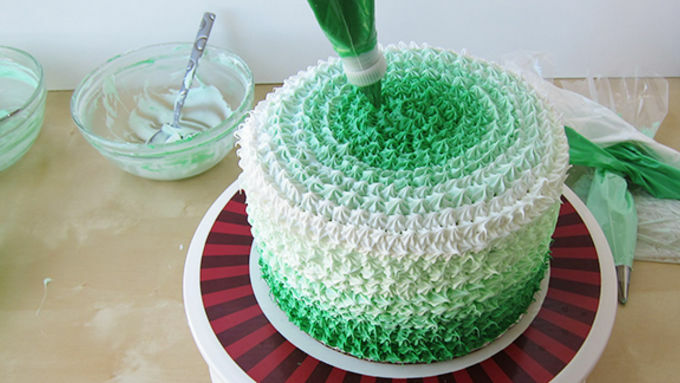 It made creating the ombre effect with the green frosting super easy. I used 5 different shades of green plus some white. I think the cake would have looked a bit better with more of the darker green, but I'm pretty sure my friends will love it just as it is! 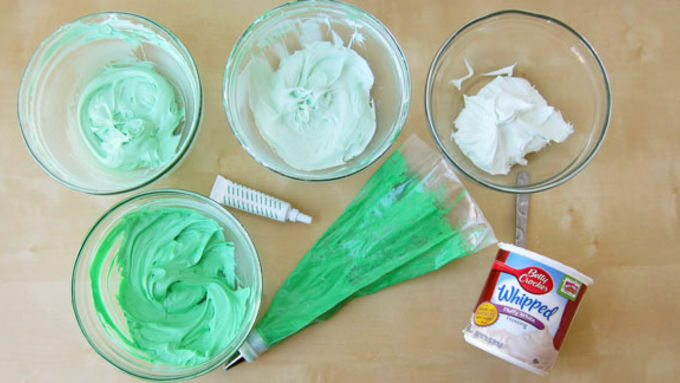 Create as many shades of green frosting as you'd like to use. I made 5 different greens and also used some white for a bit of contrast. Happy St. Patrick’s Day!